Parking Structure Gets Flair | Grunau Company, Inc.
A parking structure is typically a utilitarian building without a lot of design aesthetics. Their sole purpose is to store as many cars as possible in the smallest footprint possible. Architects from KM Development teamed with Architectural firm Epstein Uhen to take a fresh approach to a common problem and add a dash of design aesthetics to this parking structure. This parking structure was built from pre-cast concrete components. It was modeled to look like a building that was previously torn down. Therefore the new structure needed some flair to compliment the red brick. So along comes Grunau Metals. 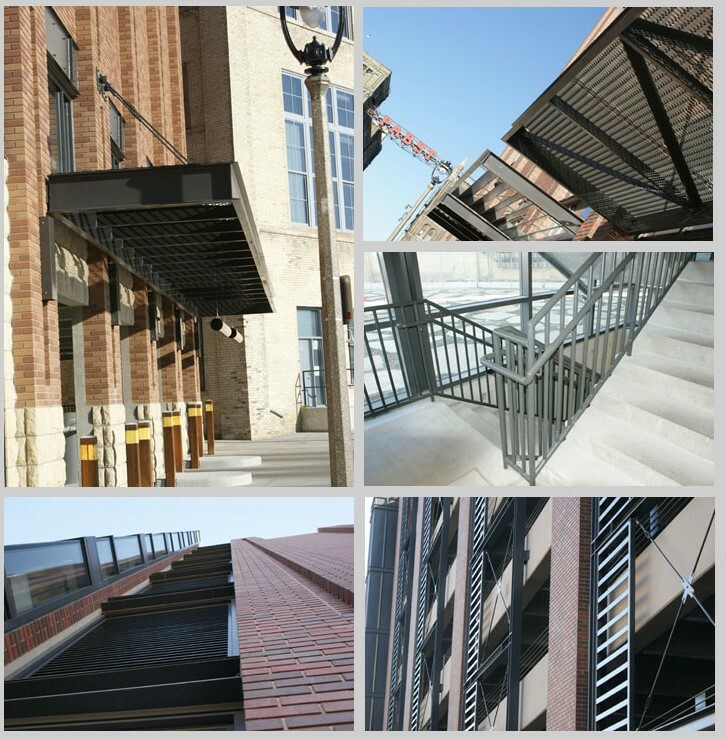 We were hired to fabricate steel handrails for concrete stairs, along with aesthetic screen towers, canopies and sunshades that embellish the outside of the building. Like earrings or a necklace, the fabricated metal pieces help to improve and finish the overall look of the structure. The trickiest part of the job was the metal finishing. We made sure the super tough coating was applied correctly to keep the structure looking nice for years ahead.